Attending a music festival could be my favorite way to spend a weekend. But you always end up seeing fewer shows than you thought, especially when there are five geographically disparate stages. Next time I go to a festival, I am going to hire me a scheduling assistant to do nothing but look at the clock and tell me when to move it along, please, to the next show. And then physically force me to do it (“Get up, Heather. Walk now.”). So I didn’t see all the bands I wanted to, but what I saw was pretty rad. Festivals are like big appetizer samplers where you really just get your appetite whetted to know who you oughta see when they come back through to the small clubs near you. This week’s roundup is five finger-lickin’ bands from Monolith that were more or less new to me, and perked up my ears. I missed almost all of Ghostland Observatory‘s set on the main stage early on the first day because my interview with Black Rebel Motorcycle Club went so well that we just kept talking and lost track of real time. I emerged from the cavernous maze of backstage hallways to see an imposing DJ dude in a spangly blue cape with a huge star on the back, a frantic lead singer, and bunches of indie rock kids wildly flailing in time to the beat in the broad daylight. It was awesome. I will absolutely make time to see these guys when they come back, because the song and a half that I got to see only left me wanting more of this stuff. Ghostland Observatory is from Austin, TX and their newest album is called Paparazzi Lightning (2006, Trashy Moped). We saw these guys on Saturday afternoon on the indoor WOXY.com stage with about 12,482 people all crammed into a very small space. It was hot and I couldn’t get any pictures worth crap. 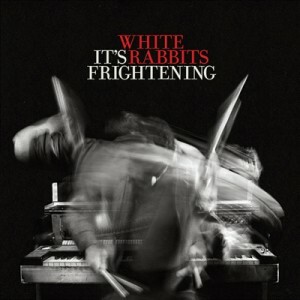 But I loved the sounds emanating from the White Rabbits. 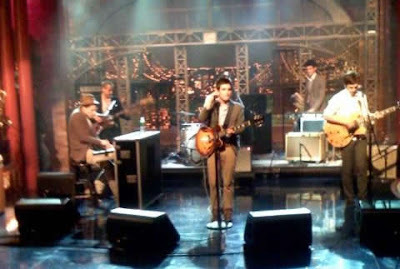 The band had a disproprotionately high number of short guys wearing dapper suits in it, and I thought that it was fronted by Fred Savage at first, which was awesome. This song boasts a ferocious thrumming piano line that I miss each time it stops, and ska-pop harmonies that blend with a welcome aggressiveness. I like it! Fort Nightly is out now on Say Hey Records. I am all in favor of girl drummers (being an aspiring one myself), and I was pleased to see a few this weekend. Elaine A of the Hot IQs kept a fierce beat, and I loved her style. She played with panache and confidence, giving backbone to the new-wave/Devo/danceable sounds of her band. 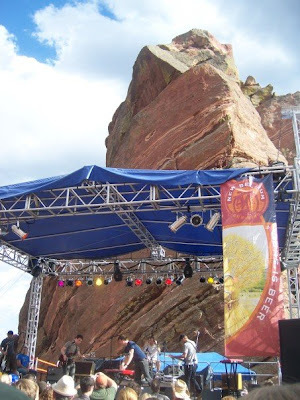 Not only is this Denver band hot, they are also smart, and took home the Best Indie Pop Band award from our local alt-weekly The Westword. This tune is off their Dangling Modifier EP (that title just wants someone to make a joke about it. Yeah, I’ll dangle your modifier. What?). 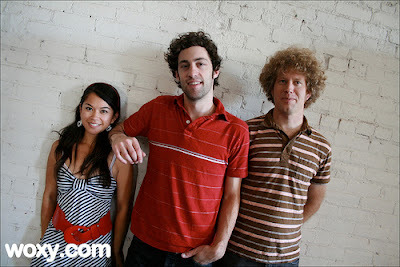 To hear more, check out their recent feature on WOXY.com with some exclusive in-studio performances. 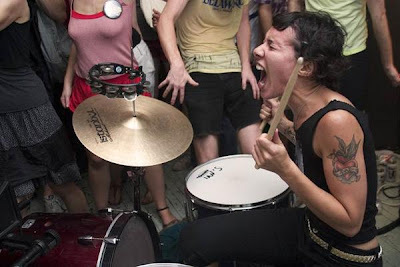 Yeah, so speaking of girl drummers, Kim from NYC duo Matt & Kim is insane. I don’t know if I’ve ever seen a pair perform with as much energy as they did Saturday afternoon. They were, like, vibrating with sheer unbounded elation, just like that picture above. I was kind of expecting fey poppiness like Mates of State, but Matt stormed the stage like an even-more-enthusiastic-for-life Ben Folds, accompanied by a wide-mouthed-in-excitement, about to fall off her drum stool whirlwind of Kim. 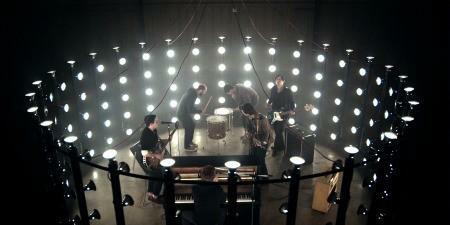 This tune is off their self-titled album (IHEARTCOMIX Records), and they pack a lot of punch for just two people. 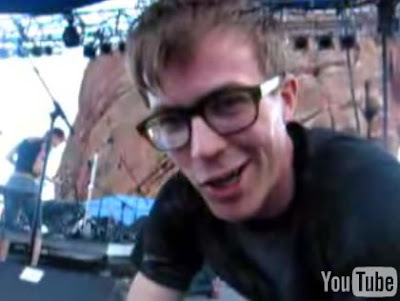 Sebastian from Merry Swankster was standing a few rows in front of me for the show and took a tiny video clip so you can see a bird’s eye view of the stage. 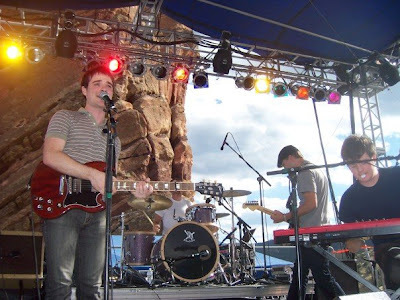 If the Hot IQs are the best indie pop band, then The Westword anointed Meese the best pop band in Denver. Go figure the difference. Both are good. While I speculated that perhaps their name referred to more than one mouse, it’s actually the last name of the two brother-member-founders Patrick & Nathan in the band. To borrow a lyric from the song, these “kids of the frozen Front Range” surprised me with a much poppier sound than I had remembered – keyboard-driven indie rock. This particular song sounds like something lost from the Third Eye Blind files, and is listed on their MySpace as “Winter 2007 Recordings.” Solid. For each artist I saw and enjoyed (see more pics; other reviews coming), there were at least three that I missed. Didn’t see Rocky Votolato, Born In The Flood, Monster Maker, Bob Log III, Cat-A-Tac, Kid Sister, YACHT, Broken West, Das EFX . . . so many more. I guess there’s always next year to try again (happily). 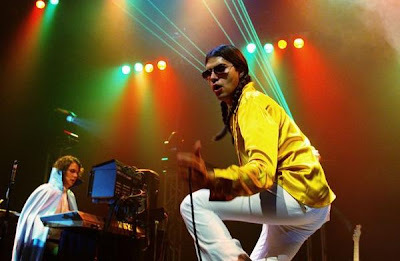 Tagged with ghostland observatory, hot iqs, matt and kim, meese, monday music roundup, monolith festival, white rabbits.